Genetic traits: Although endowed with less than average intelligence, dwarves are a very wise people who are quite sturdy and strong. Their sun-baked, tan, leathery skin and white hair however leaves them as unattractive in the eyes of most humanoids. 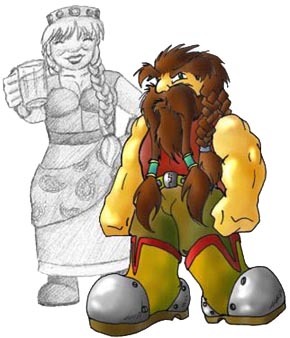 Physical description: Dwarves are short, strong humanoids who often wear beards and their white hair in long pony-tails. They are known for their work in mines and their knowledge of magic.